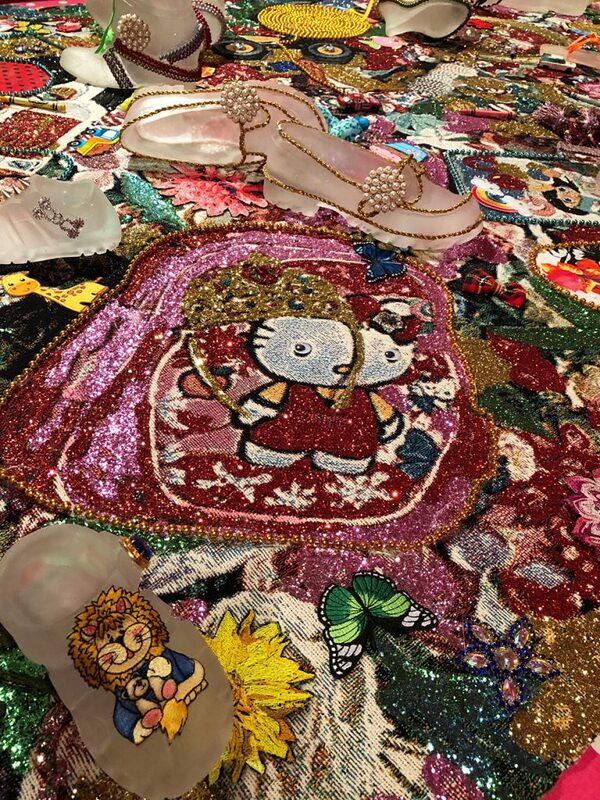 Sequin-encrusted tapestries, decorative wallpaper, delicate frosted-glass forms, and images of shoes, purses, and jewelry all comprise Ebony G. Patterson’s vocabulary. In her work, these materials defy their prescribed connotations, taking viewers to unexpected and sometimes dark places. 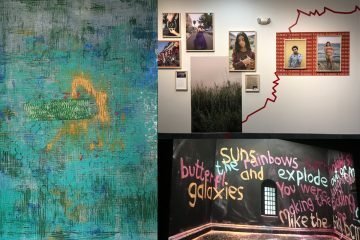 Twice within the last year I was able to view solo exhibitions by Patterson: First in …while the dew was still on the roses… at the Pérez Art Museum Miami (PAMM) during Miami Art Week and second in …for little whispers… at the Baltimore Museum of Art. 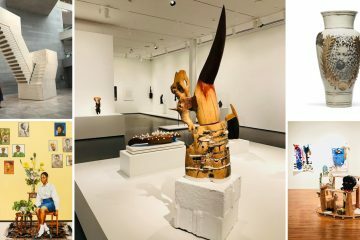 Despite differences in scale, both exhibitions function as immersive, multimedia installations and share a consistent visual language, decoration, and intention. Patterson, born in Jamaica, has unwaveringly used her work to emphasize the damage of colonialism and violence against people while highlighting excess in embellished material culture and beauty. At PAMM, Patterson’s work was insulated from the Art Basel experience, housed in a large gallery that allowed a limited number of people inside, with a designated entrance and exit. But the irony of the time and place, so full of money and excess and parties, made Patterson’s visual conversation about disenfranchisement more palpable. In Miami, her exhibition drew inspiration from the refuge of gardens, parks, and public spaces. I felt a sense of safety and protection in the gallery, which was filled like a baroque interior with custom patterned walls, glass shoes, and large faux-floral bushes. 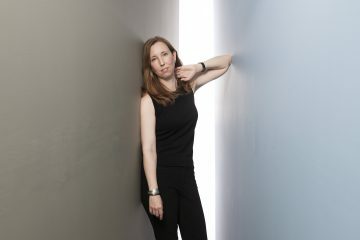 The contrast between the colonized communities that Patterson references in her work and the privileged sectors of populations who are afforded more protections was exacerbated by the Miami Art Week backdrop. The urgency of Patterson’s work is just as palpable in Baltimore, but resonates differently—the city’s history of extreme economic, racial, and social disparities, especially for children, sets the scene for her work here. It makes me question the idea of protection: Who is considered worthy of protection in a world so full of resources, and who gets to decide the distribution of power and safety? The pink polka-dot-filled …and babies too…, much smaller than the PAMM exhibition, is on view in the BMA’s Berman Textile Gallery in the American Wing, offering a pointed contrast to the many objects signifying wealth in the surrounding galleries. This exhibition is clearly a memorial, despite the artist’s restrained use of traditional funerary or ceremonial symbols. In the center of the room, an elevated table, made in Baltimore of unfinished pine, alludes to a pauper’s casket. Strategic material decisions like this further the notion that what we have access to in life dictates our aesthetic surroundings, even through the end. 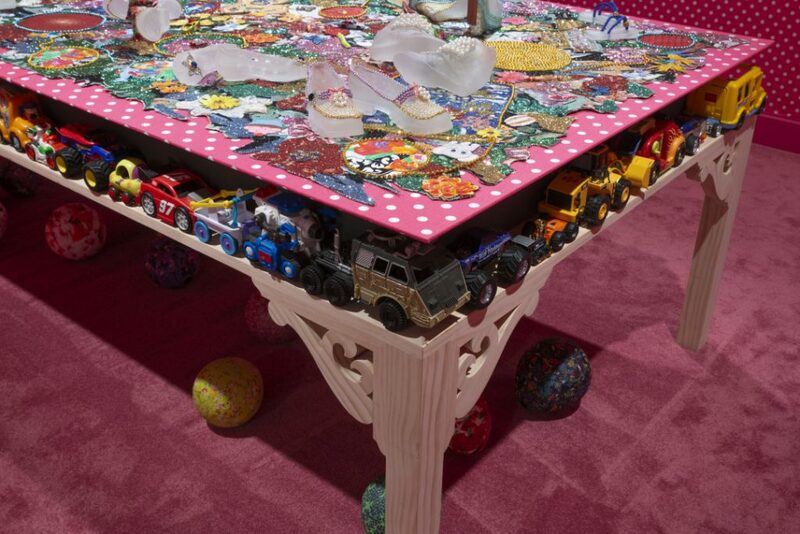 The table is lined with toy cars and trucks, and holds a bedazzled tapestry with glass sneakers and flip-flops. The glass shoes are decorated with colored laces and beads, giving human qualities to the individuals they honor. Hello Kitty and cute animal patches sparkle alongside a police car patch on the sewn tapestry. In the shadows below the large table, anchored paper maché balloons feel emotionally and physically heavy. These haunting details summon ghosts into the room alongside the viewer. 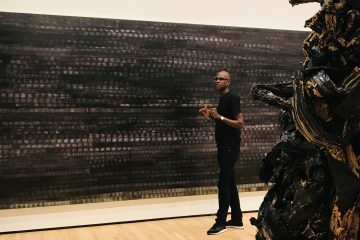 When you read the wall text and realize the work was made to memorialize 18 children, nine boys and nine girls, killed in Patterson’s hometown of Kingston, Jamaica in 2015, the piece becomes even more poignant for a Baltimore audience. Both the exhibition’s location in Baltimore and the title’s reference to the Vietnam War (the wall text mentions a 1968 Ronald L. Haeberle photograph of women and babies murdered in the My Lai Massacre) reinforce a global narrative of disregard for life and humanity under oppressive power structures. 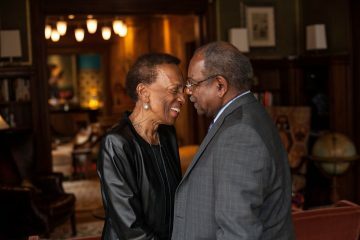 Patterson’s work asks why children are not afforded basic protections because of circumstances outside of their control, like their birthplace or their skin color. 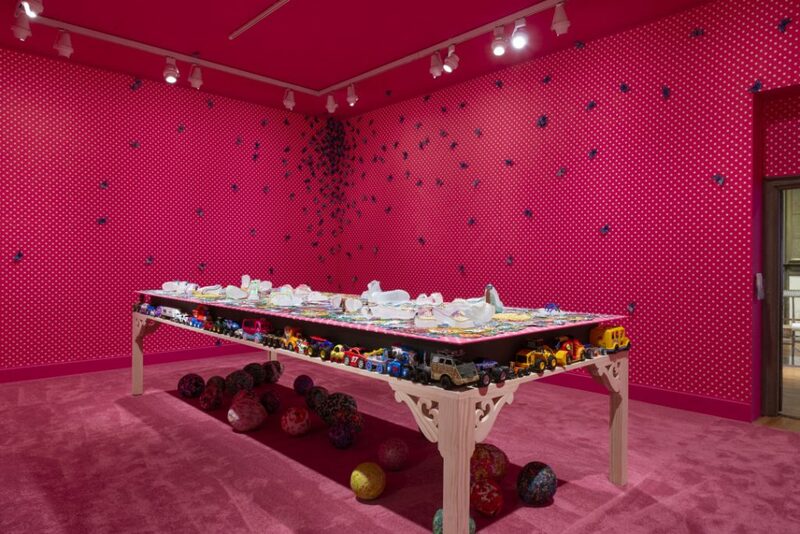 To create a sense of protection, or enhance the lack thereof, a thick swarm of black artificial butterflies accumulates in the corners of the walls, on top of the hot pink, polka-dotted wallpaper that evokes a child’s bedroom, as if hovering over death. Their congregation in the room represents life and death cycling and coexisting amidst the beauty and horror of their surroundings. 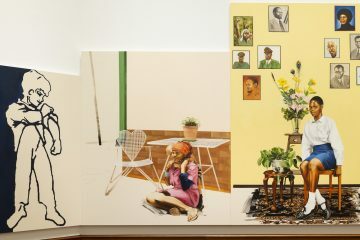 In a separate part of the American Wing, a symbol of colonialism in its own right, Patterson assembled another intervention-style artwork, inspired by the painting “Charles Herman Stricker” (1804) by African-American artist Joshua Johnson, known for painting prominent Maryland residents. The painting depicts a boy in fine clothing holding a rifle. This feels like another nod to the social and cultural disparities often referenced in Patterson’s work. According to Assistant Curator of Contemporary Art Cecilia Wichmann, Patterson was also struck by the boy’s red shoes, a functional accessory that the artist often uses as a symbol for children in her installations. 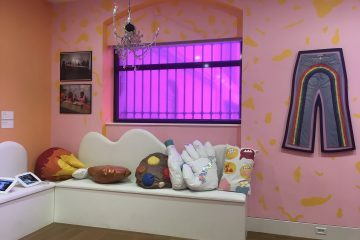 Patterson surrounded the painting with 150 hand-embellished toy guns covered in sequins that initially offer a cheery sensation. This piece, titled “…made for kids…,” is visually jarring in the museum setting but makes conceptual sense. 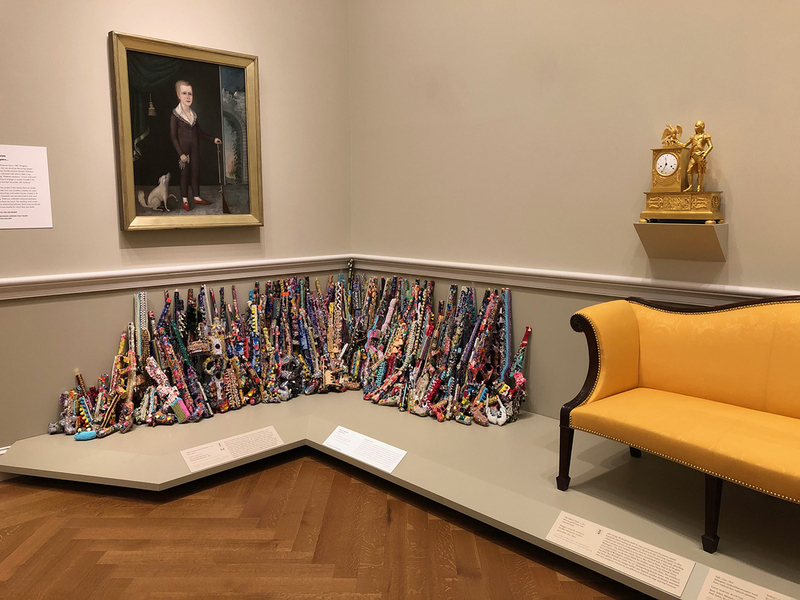 Patterson’s embellishment of this work pulls at the long and complicated history of this country, the second amendment, and children’s desensitization to violence through toy guns and frequent threats of violence. This work also relates back to larger cultural values around protection. In the United States, guns continue to function as symbols of freedom, protection, cultural currency, racial privilege and disparity, and even glamour. Those who die by ignoble means are often depicted in a dark light, blamed or even ignored, as was the case for the children murdered in Jamaica in 2015 that Patterson represents in her installation. The traditional museum context forces the presence of “…made for kids…” to sit in stark contrast to the colonial relics of the American Wing. The context makes it even more powerful and relevant to debates over gun control that continue with no resolution. In Patterson’s Miami show, the great scale of her garden-inspired work engulfed me in a protective oasis. In Baltimore, I am in equal visual awe, but also left wanting more conversation around her work, more of her energizing pieces, and more space to feel the sense of protection that her works offer. As an artist with maximal leanings and an interest in the symbols of luxury and taste, I feel an immediate and deep aesthetic connection to Patterson’s work. She wrangles color, texture, and materials into an opulent experience that people can quickly access, and then savor. 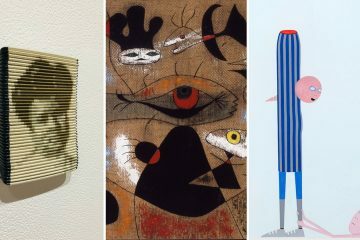 Her work could stand on its visual exceptionalism alone, but it pushes further—she has carved out a small chunk of her world and dedicated it to children who were issued a gravely unfair and short time on this earth. With vitality and eloquence, Patterson questions the systems around us, zeroing in on the failing structures of old. 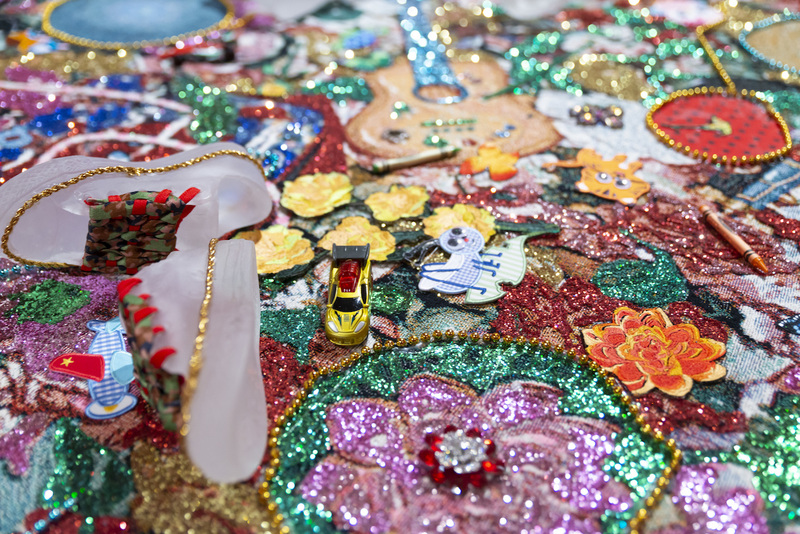 On March 28, Ebony G. Patterson will be in conversation with Erricka Bridgeford of the Baltimore Ceasefire movement at the Baltimore Museum of Art. The conversation will be moderated by Cecilia Wichmann, the curator of the exhibition. For more information on the event see the BMA website. …for little whispers… is on view until April 7.